The new year has started and we are now in the other half of the season. 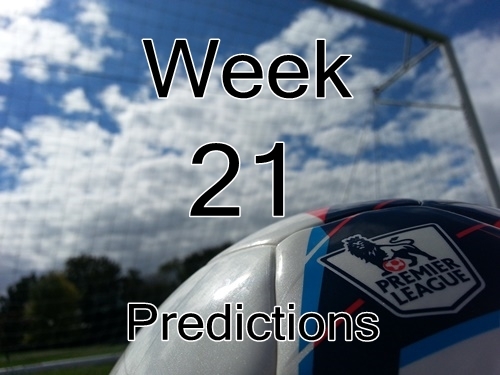 Match week 21 returns to its regularly scheduled weekend times after last week’s round 3 FA Cup matches. The flurry of holiday games has come to an end and most teams will have had a chance to get a bit of time to recover and prepare for week 21. This is the time of year when the table begins to sort itself out. Managerial changes are being made and we may see some more in the coming weeks, particularly with Burnley and Leicester City. This weekend brings three big matches in terms of table implications. Saturday features two relegation battles with Burnley hosting Queens Park Rangers and West Bromwich Albion v Hull City. A Burnley win would have them swap places with QPR. West Bromwich or Hull City could see themselves in the bottom three depending on their result as well as the results of teams around them including Burnley, Queens Park Rangers, and Crystal Palace. Chelsea play Newcastle United at home and are expected to win and maintain their place at the top of the table while Manchester City have a difficult trip to Everton, but should win. Everton have been pretty bad defensively this season and lead the league in defensive errors and errors leading to goals. With the attacking options available to City, they should be able to capitalize on these frailties. Tottenham, Arsenal, and West Ham United are all hoping to keep pressure on the top four places and could gain ground with Manchester United hosting Southampton. The reverse of this fixture at St. Mary’s saw a poor Manchester United side somehow pull off a 2-1 victory despite their terrible play. They have continued an unbeaten run that has been extended to 11 games following their FA Cup win over Yeovil. Southampton have won three out of their last four in the Premier League and managed just a 1-1 draw at home to Ipswich in their FA Cup match. This is stacked up to be a good match and seems fitting to have it be the last match for week 21 this weekend. It is hard to make a prediction on who will win this, but my pick is for United to continue their fine run and further solidify their third place position.